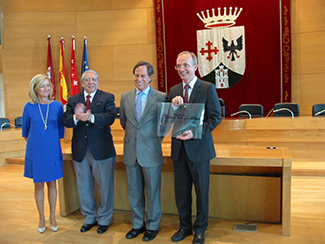 Yesterday Alcobendas Municipal School of Excellent Management diplomas were given; Humana supports this School through the First Edition Scholarships EGME thanks to a part of the funds raised to the valuation used textile delivered. This municipal management course was held from 19 to 23 October with the participation of 21 representatives (among mayors, councilors and technicians) from different municipalities of Bolivia, Chile, Ecuador, El Salvador and Peru. The amount of each scholarship was 1,200 euros per person. One of the thematic areas addressed during the course was street cleaning, refuse collection and maintenance of green areas. This module analyzed the different waste collection systems, both organic and recyclable, which include textiles. Proponents of this course are the City of Alcobendas Foundation, the Department of Cooperation and Humana. Participants, after an intense week of work, have gained much experience in municipal management from now on be able to adapt in their municipalities of origin in Latin America, promoting the development of themselves and their neighbors. 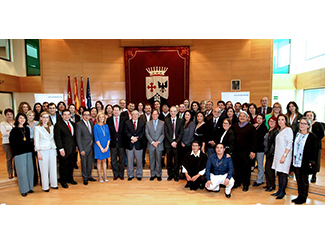 Humana's collaboration in this call for scholarships is another example of the harmony that exists with the City Council and the City of Alcobendas Foundation. Thus, in June 2014 a joint agreement with the FEB 2014 Foundation (Spanish Basketball Federation) that allowed allocate 25,000 euros to the Centre for Integral Training House Spain, in Hann Bel Air, Senegal, home to 330 boys and girls was signed disadvantaged families. Also in 2014 the collaboration between the two Foundations materialized in assisting eight families in the Philippines affected by Typhoon Yolanda. Through the Red Cross, Humana brought 5,000 euros to the relief effort. And all thanks to the recovery of used textiles collected in Alcobendas. It is the social order of the used clothes.